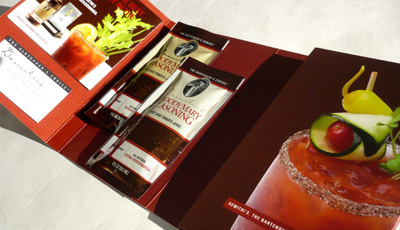 Design Hovie Studios has designed the new sample mailer pack for Demitri's Bloody Mary Seasoning. The pack, designed to fit into US Mail boxes contains the company brochure, CD-Rom, and samples of Demitri's bloody mary seasoning and rim salt. The piece was created by designer Maxwell Churchill under the creative direction of Hovie Hawk.